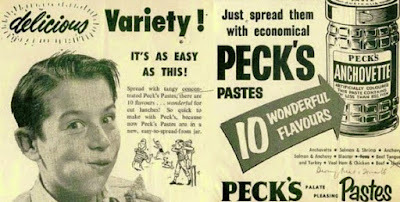 Peck's meat and fish pastes were something I grew up with. They came in small glass jars and offered up a variety of tastes, from fish, salmon, beef and chicken and were spread on bread. I did go looking for the story of Peck's a few years ago but the research led nowhere and I gave up. Now I knew there was an Australian connection because the jars arrived via a friend of mums who was given them at work and she said they were from Australia. It never occurred to me to ask but I think B worked for a wholesale firm and these came as one of the perks of the job. You were never quite sure what would arrive and I suspect that was also how it was with B.
I remember they dominated our lives and were a quick meal, although now I have no idea which I preferred. Looking back now over fifty years I see they sit along with dripping, blancmange and tinned fruit salad as part of our basic diet and would only be replaced by the fish finger, beef burger and instant whip sometime in the 1960s. Not that any of this helped with Peck's products. 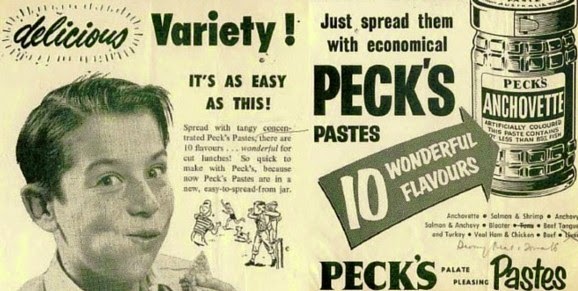 It would appear that Peck's were making their spreads in Britain by 1891 and opened up in Australia in 1904 reaching their highest sales in the 1950s and 60s. All of which fits and confirmed that I hadn't mistaken our Australian paste jars and of course offers up that simple observation that more often than not childhood memories are more likely to be true than imagined. And in turn reminds me of that post war period when rationing had ended but the full impact of the consumer revolution had yet to arrive and in the absence of a cornucopia of instant foods, Pecks pastes on sandwiches did the job.